When Technocultures Collide offers a critical survey and hopeful treatise that elucidates, as the controversial, independent scientist James Lovelock does, that survival, as a mosaic of independent coordinates and disparate angles, will be possible not from less technology, but from more (the Guardian, March 1, 2008). Genosko argues that the coordinates are made relevant and apparent by paying attention to where, how and by whom technologies are mashed, resignified and imagined altogether. The disparate angles, the chapters as vignettes on a common theme of techno-culture, represent a diversity of action, thoughts, inventions and processes that together diverge and reflect the multitudinous ways in which a quest for autonomy drives innovation. Genosko’s When Technocultures Collide argues that technoculture is oriented towards elevating or subverting dominant regimes of power, not by thoughtlessly ascribing to failed technological futurist ideals, but rather electrifying the forgotten wards of creative potential by truly going where no one has gone before. This book is unique and brings together technology and cultural studies in a way that engages action as an everyday manifestation of a quest for autonomy; this includes explorers, rogues, anarchists and other forms of counter-cultural practitioners in direct contact with cultural theorists. The book is enlivened through Genosko’s wry sense of humor, coupled with his established history as an author and editor of books on communication, surveillance, and philosophy; his books include critical works on Baudrillard, Bataille, Guattari, McLuhan and more recently “Bifo” Berardi. Within this work, each of these theorists makes their appearance and influence known as critical and theoretical interlocutors throughout, for example McLuhan and electric light. By drawing connections between, for example, Bataille, feet, and big toes, Genosko swiftly pulls the reader under the proverbial table to illustrate how new theoretical and technological heights can be reached by getting low and feeling the vibrations. Throughout the book Genosko makes reference to the individual and cultural benefits of paying close attention to periphery, disability and perceived limits. The tactic of traversing the forgotten regions of one’s own body shares a similarity of course with exploring one’s own mind, sweeping the debris from unused corridors and blazing trails through uncharted territories. This book is drawn together by a common theme as a collection of essays written over the course of Genosko’s tenure as a Canada Research Chair in Technoculture Studies (2002-2012) while at Lakehead University. During 2007-8 Genosko offered mentorship as my Masters supervisor and in turn I worked as a research assistant on some of the topics found in the book such as the Crackberry and cowboy electricians. In effect, this book is a manifestation of a research focus where, over time, the objects of inquiry that appear in the book were those that made headlines or were otherwise taking place between 2002-12. Of course the bounds of the focus-period stretch beyond and before 2002, such as with Genosko’s analysis of IBM’s Deep Blue and the 2006 world champion of chess, Garry Kasparov. Sculptor Robert Smithson once argued in the mid-1960’s that the “energy drain” of a euphoric entropy was on display in the New York blackout of 1965: “Far from creating a mood of dread, the power failure created a mood of euphoria. An almost cosmic joy swept over all the darkened cities. Why people felt that way may never be answered (Smithson 1966 in Genosko 2013: 117). Thematically this book makes an upward trajectory, from below as the title suggests, across desks, codes and computers, and explores the potentiality of a physical disability like blindness where unseen possibilities ring–tone’s of truth and expose the fractured strata of machinic mimicry. Across its chapters, When Technocultures Collide shifts away from bodies in place into technocratic and virtual realities while revealing a chronology of temporal dependencies as packets of time, rapid development and towards outliers like Julian Assange and the political significance of WikiLeaks. Renovation of such concepts as a leak, do well to reveal the coming outpouring of democratized, or better yet, transparent and open critical modes of living that may see the waning of the authoritarian meta-narrative of security in a post 9/11 world (Genosko 2013: 169). Technology originating from unexpected regions commands attention because of its seemingly marginal starting point in relation to the limitless potential for ascendancy, ubiquity and autonomy. The unknown potential of ongoing technocultural collisions signal the further exploration of uncharted realms, especially by those who may occupy liminal zones of existence. Genosko succeeds in bringing the reader along for a ride through a decade worth of research into the ways in which technology plays a central role in everyday life. By using examples like MafiaBoy, WikiLeaks, phone phreaks and hacking electrical grid, Genosko masterfully weaves a collection of independent stories into a cohesive narrative, offering a veritable manifesto on reaching for autonomy in an increasingly commoditized, codified, and quantified human existence. 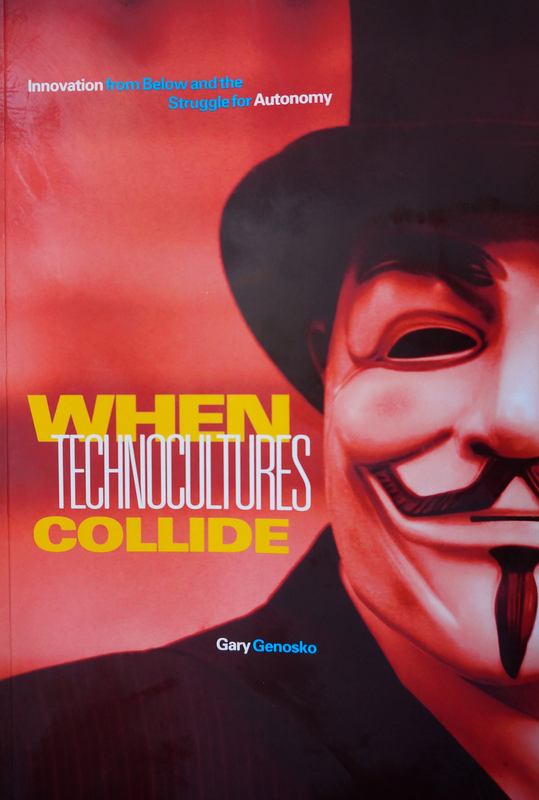 The cover image of When Technocultures Collide, the Guy Fawkes mask, is undoubtedly a deliberate maneuver and allows for quick visual identification and association with the tone of the book. Genosko dons a mask as an ode to not only the midlands revolt of 1605 and its namesake conspirator, but also to an always present, even if quiet, revolt against lightly veiled fascist entities such as; the privatization of the electricity market, attributed to Theodore Roosevelt in the 1930’s (Genosko 2013: 111); the slow accruing of insider knowledge between urban explorers traversing mapless places (69); or mobilization beyond the limits of representative democracy – and here by quoting fourth-hand, ‘by challenging power, by challenging the normal channels of challenging power and revealing the truth’ (Giri 2010, Zizek 2011, Genosko 2013). When Technocultures Collide may appeal to a wide range of readers, such as those interested in Canadian history, digital art, digital culture, cultural theory, post ’68 Marxist Theory, and post _______ theory. Dr. Andriko Lozowy conducts research and works as a photographer and carpenter in Edmonton, Canada. In 2013 he defended a doctoral dissertation, with examiners Rob Shields and Jussi Parikka, titled Icons of Oil: The Photographer-Researcher and Collaborative Practice, at the Sociology Department of the University of Alberta. In 2006-7 he worked closely with Gary Genosko at Lakehead University in the Technoculture Lab, where he earned his Masters degree. Andriko is also an editor and designer of Imaginations: Journal of Cross-Cultural Image Studies.